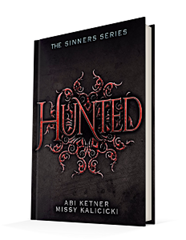 Published on Published April 28, 2015, by Month9Books, Hunted by Abi Ketner & Missy Kalicicki is the second novel in their YA dystopian Sinners trilogy. Meh. Picking up where the previous novel, Branded, left off, the “heroes” are on the run from the government that would like to see them punished for their startup revolution. Although, the revolution was as short-lived as possible as the doctor has reached out to the United Powers to expose the Hole for what it is: a prison that illegally experiments on its subjects, many of which are innocent. Again, the concept is interesting but the story, well, it starts to lose itself. 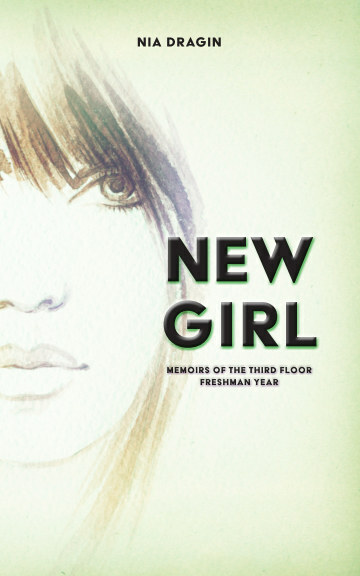 The beginning is fast-paced. The reader is dropped right in the middle of the two main characters in a car on the run to a safe-house. For the moment, everything is calm, and then out of nowhere, the novel turns into an action film, with guns blazing and fast car chases. They even get caught in a steamy session in the shower that involved nothing more than kissing before a dangling spider ruins everything. After that, well, the novel’s pace begins to slow down into something dreary. The novel becomes one thing: running and hiding with no actual tension. That is not to say there is no tension at all, but after the first three times of almost getting caught, the tension disappears. The story begins to loop around, and it is all the same, scene after scene, of Lexi and company running and hiding from Wilson and his men. Okay, the reader gets it, but the end goal of the story begins as a rescue mission, a mission they fail or is completely forgotten. It is hard to determine which because once the group enters the Hole; it is almost like the rescue part of the mission is forgotten and replaced by something else. To be clear, the story is not exactly clear what it is becoming. Then there are the character dynamics, well, even in the first novel they left something to be desired, and now, well, they just seem too “perfect.” Lexi always seems to know the right thing to say no matter the situation, and she takes things in stride. She is also aggressive and a fighter without a fault. Now, any female reader can appreciate the power given to a leading female character, however, to make the character relatable instead of like a Mary Sue character. She is too perfect; she says the right things at the right time, she is to tempered rather than impulsive. There are times when it is clear this is a fictional character because she is too perfect. She is missing a human element, a relatable element. She is missing faults. There’s nothing wrong with her character, and that is her problem. In the end, she is just a very two-dimensional character. Moreover, that goes for her band as well. These characters are not really fleshed out; they are not given room to have faults, except for maybe Cole whose main fault was incredibly predictable. His “plot-twist” could easily be seen miles ahead, and it was. Moreover, again, that tension was resolved oh so very quickly because these characters are just too damn perfect, Lexi is just so perfect that it is almost unbelievable, her recovery. Again, as a sequel, this was not great. The pot dragged out and lost itself along the way, twisting into something almost unrecognizable, and then the character dynamics lacked dimension.